1/2 cup of pepperoni slices, or more/less – use your judgement and preferences! Combine the water, yeast, honey and olive oil in a bowl and stir once or twice with a spoon. Let sit until the yeast is foamy, about 10 to 15 minutes. Once foamy, add in the flour, salt, pepper, basil and oregano, stirring until the dough comes together. If it’s super sticky, add in a few more tablespoons of flour. Knead the dough a few times with your hands then place it in an oiled bowl and let it rise until doubled in a warm place, about an hour and a half. Once the dough has double, roll it into a large rectangle, about 12×18 inches. Brush the dough with the melted butter and spread the marinara on top. Sprinkle the cheese over the sauce, top with pepperoni slices and sprinkle with the parmigiano. 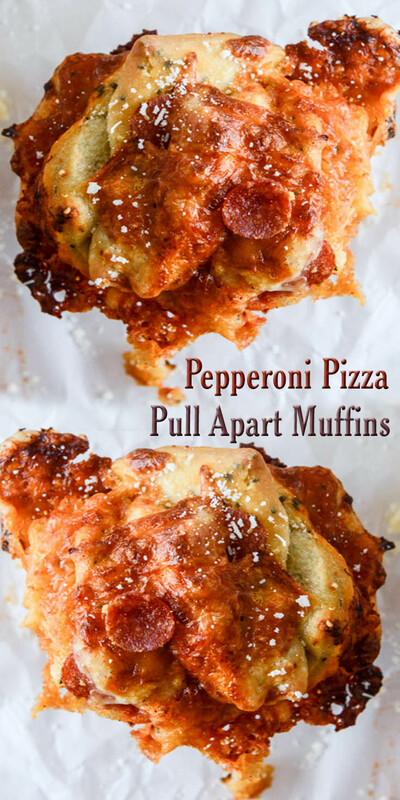 Use a pizza cutter or knife to cut the dough into strips and then the strips into small squares that could fit in a muffin tin. Stack a few pieces of dough together, about 5 or 6 pieces (again, use your judgement here, they won’t all be perfect and you may be stuffing dough in each muffin cup at the end) and stuff them in the tin. Do NOT over stuff! The dough will rise and the cheese will bubble and you will have cheesy smoke and butter everywhere. Let the dough rise in the muffin tins for 20 minutes. Place in the oven and bake for 25 to 30 minutes, or until the cheese is golden and the dough is cooked. Let the muffins cool slightly before using a spoon to lift them out of the tin. Serve with extra marinara sauce!